By the end of this year, Microsoft will have launched Windows 10 Mobile and, alongside it, a couple of highly anticipated flagship smartphones. These were expected to be called Lumia 940 and Lumia 940 XL, respectively, but it now seems more likely the company will go with Lumia 950 and Lumia 950 XL instead. Still, they're the same handsets, just with different names. Up until now we've seen one of them go through a benchmark, a camera unit leaked with triple-LED flash, and we've had some rumored specs too. 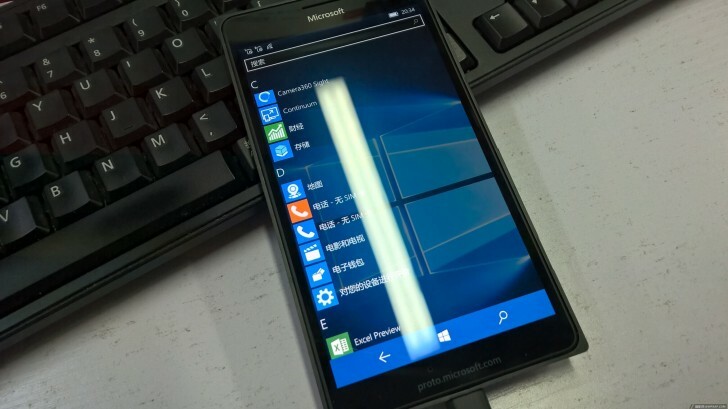 Now though we get the first ever image showing a prototype of either the Lumia 950 or Lumia 950 XL. Which exact device this is is hard to tell from the image. That shouldn't be an issue though, as they're supposed to be very similar in terms of looks - just with the XL obviously being larger. The prototype you can see above is inside a special case, but you can distinguish its rounded corners even so. The device has dual-SIM functionality and sports a QHD (2,560x1,440) touchscreen, which will be a first for the Windows world when it launches. It's also got a USB Type-C port, and it's powered by the Qualcomm Snapdragon 810 chipset aided by 3GB of RAM. It currently runs Windows 10 Mobile Insider Preview, and its model number is RM-1116. Its camera can shoot 1080p videos at up to 90fps and 720p videos at up to 120fps. The Lumia 950 and 950 XL will probably be made official by Microsoft at an event in New York in October. On the same occasion, we may also see the Surface Pro 4 and Microsoft Band 2 getting unveiled. Its a Microsoft. What do you expect? A touchpad? Even our laptop and computer have on screen start button. This is not like your android phone or iphone.